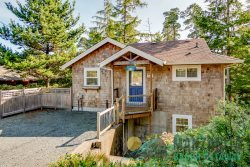 Enjoyed the property, and walking or biking distance to all of Manzanita! This is our second visit and we would love to return again. Well equipped home and in excellent condition.The design, layout and furnishings. View is great too. Great location, very close to a beach and fairly secluded. Houses only on one side of the street- although a fair amount of people park on the street for beach access (wasn't a problem). House laid out nicely for a beach house. Appreciated the bunk beds had queen sized mattresses on the lower bunks in case adults had to stay in the room. Kitchen appointed better than most beach house. Tell us about your favorite feature of the property: The house was absolutely beautiful! Everything that we could have possibly have wanted was already in the house. The furniture and decor is very durable and comfortable. We all joked that we would like to pick up the house as-is and take it home with us. I loved the fire pit in the backyard, my brother (the chef) loved the kitchen, the kids love the bunk beds, and we all loved the location. We will definitely refer this property to friends and anyone else who will listen, and hopefully we will get to return some day. Thank you for a wonderful family reunion. Loved the property - tastefully decorates, clean and perfectly located. Will definitely reserve again for next year. Too many to pick just one, but I'd have to say its location and all those windows -- looking out over the park and the beach from the living room was just perfect. The house's amenities far exceeded our expectations for a vacation rental, especially access to the bikes. And the house was SO clean! And the beds were very comfy. We arrived just a little early after traveling from Spokane, WA, so we parked at the house and our plan was to walk the beach until 4. However, our daughter had to go potty really bad and we were debating on if we could find parking, or a bathroom in downtown Manzanita on a busy Saturday afternoon. We called as a last resort to see if we could get in to the house early and the members of your team let us in. I swear you saved our day!! That was a very unexpected and kind thing for you to do! Thank You!! Our family was visiting because we love the Manzanita area and we haven't been there to stay in a while. The rental, and your company were all very wonderful. Thank you for keeping your standards high and sharing the beauty of Manzanita with all who travel there. We traveled with my in-laws and they had the master bedroom upstairs. It was perfect because they could see the ocean and they didn't need to travel up and down the stairs to get to the kitchen or to their room. My children, husband, and I slept in the basement and we all loved being able to have our own rooms and space. The house was nicely equipped with a dog kennel suitable for our dog and a basket full of towels and dog dishes specifically for her and her needs. The downstairs bathroom had a tub with an adjustable shower head that my 8 year old thought was amazing. The walk to the beach was very quick and we made some wonderful memories there. The team were fantastic. Very professional, friendly and responsive. Great location!! Also the space was really well laid out - better than our previous rental in the area.